Posted 7/16/2012 7:31pm by OONA COY & BEN JAMES. Here's what'll be in the share this week, and listed below is everything we'll have at market. JAPANESE EGGPLANT, CUBANELLE PEPPERS, RED RASPBERRIES! (not a lot – the last of the season), oodles of GREEN BEANS, FRESH SUMMER ONIONS, CUCUMBERS (crisp & juicy, here's a recipe for quickles), YELLOW SQUASH, ZUCCHINI, PATTY PAN (here's a great tandoori kabob recipe), ripe, red TOMATOES, SUNGOLD CHERRY TOMATOES, FRESH GARLIC BULBS, CILANTRO, DILL, PARSLEY, RED CABBAGE AND TENDERSWEET CABBAGE, HEAD LETTUCE, CARROTS (Here's how we got them), BEETS, KALE (here's a great recipe for Massaged Kale Salad), SWISS CHARD, SCALLIONS, and SHAVED ICE! We'll see you at the farm. We'll see you at market. We'll see you somewhere! Posted 7/8/2012 7:52pm by OONA COY & BEN JAMES. 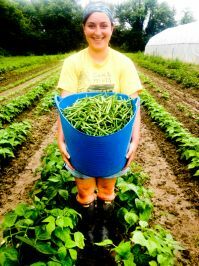 Every Sunday morning Oona wakes at 5:00, hops in the pickup, and makes a loop around our corner of Northampton – Hockanum Road, Pomeroy, Old Ferry – checking the crops in each of our five fields. It’s a precious time for her, alone with the dew and the ripening vegetables. She makes lists on her phone of the coming week’s tasks, and she begins to compose an outline of how the next several days will unfold. In her privacy, she holds the whole week and the whole farm in her mind. It takes maybe an hour-and-a-half. When she returns there is always something in her hands – the first garlic or onion bulbs, some too-small beans, the leaf of a watermelon plant with some curious spots that will need to be researched online. She brings stories of things she’s seen. She complains about deer and woodchucks. She is full of details and decisions and urgencies. But more than anything else she is full of the cool, dewy morning. It radiates off of her. For ninety minutes she’s had the farm to herself. She’s had herself to herself. It won’t happen again for another week. One morning last February, Silas (who was then five years old) woke before dawn and announced he was heading outside to do some detective work. Oona, half asleep, told him to put on his coat. We woke an hour later and discovered he was gone. We searched the animal barn, the CSA shed, the first floor of the house. Oona sped off in the truck and returned ten minutes later. She'd found him three blocks away, smiling, looking proud, walking homeward with hands stuffed into his coat pockets. We still don’t know exactly where he went that morning, though he claims to have made the long loop down the dyke, up Williams and back around onto Henry Street. He was returning, he claimed, only because his hands were cold. These loops – one made regularly by Oona, the other made only once by Silas – make me think, for reasons I can’t entirely explain, of part of a poem by William Carlos Williams. It has to do with that word, yield. There’s the abundance – the sheer, glorious, radiant abundance of all this food. But there is also the giving over, the making way, the act of submission. I do not know what particular sensations propelled Silas on his small, private journey that winter morning, but I picture him walking alone, shoulders a bit hunched, eyes to the ground while the cold, bright day opens above him. Small guy. Detective. In a moment he will accept that his hands are just too cold. He will realize that he can not roam any longer. He will turn around and head home. RED RASPBERRIES! (I'm a fool for raspberry fool), GREEN BEANS, FRESH SUMMER ONIONS, CUCUMBERS (crisp & juicy, from the field and in abundance), YELLOW SQUASH, ZUCCHINI, PATTY PAN (here's a great tandoori kabob recipe), RIPE, RED TOMATOES, SUNGOLD CHERRY TOMATOES, FRESH GARLIC BULBS, CILANTRO, DILL, PARSLEY, RED CABBAGE AND TENDERSWEET CABBAGE, HEAD LETTUCE, CARROTS (Here's how we got them), BEETS, KALE (here's a great recipe for Massaged Kale Salad), SWISS CHARD, SCALLIONS, and SHAVED ICE! And here's what's in the CSA share this week, including important info on PYO raspberries. We'll see you somewhere! Be well! Mary & Mairead with their Raspberries! Posted 7/2/2012 7:03pm by OONA COY & BEN JAMES. It must sound like I'm complaining, though really I'm not. We like it this way. And who could we complain to, anyhow? Who is there to blame for this affliction of bringing tens of thousands of living things into our lives every summer and then worrying about each of them individually. And who, anyway, wouldn't worry about this little guy, the first tadpole in our pond to officially become a froglet? OK. So. RASPBERRIES are not something I'm worried about. They officially remain the celebrity crop of the moment, although what the ZUCCHINIS and CUCUMBERS lack in red sultriness, they more than make up for in sheer abundance. Here's what's in the CSA share this week, and listed below is what we'll have at market on Tuesday. Check out the Tuesday Market newsletter for tons of great 4th of July recipe ideas. Or just place a raspberry on each of your fingertips, dip them one after another in whip cream, and then eat them very slowly, savoring every last bite. That's all. See you at market. See you at the farm. Make sure to take good care. You know how I worry about you. Posted 6/25/2012 7:24pm by OONA COY & BEN JAMES. The early poppies are new to us here at the farm, and we've been loving them almost as much as the bees have. Hope all you shareholders admired them while you were here. Did you know that if you sear the stems before putting them in water, the flowers will actually hold up pretty well for a couple of days? We've been enjoying the wild swings in the weather, and – for the most part – so have the vegetables. It's full summer mode around here, with cukes & squash in abundance, not to mention beets, carrots, sugarsnaps, high-tunnel tomatoes, and all those glorious greens. Oona made us a real farm meal of zucchini fritters, a grated apple & turnip salad, and yummy broccoli in lemon juice. Raspberries & whipped cream finished it off. If any of this whets your appetite, you can bring the goodness to your own home. Here's what's in the CSA share this week, and listed below is what we'll have at market on Tuesday. Our new pond, which was dug in the fall, is coming to life! A couple different frog species have taken up residence, and dozens of tadpoles (not to mention two boys and a bunch of crew members) have been busily swimming about. The water-loving plants are getting established along the perimeter – their job will be to filter nutients from the pond and keep the water pristine. The pond is fed by rainwater from our roof, which flows from a sluice that confuses the hell out of almost anyone who looks at it. This the flow during this morning's wonderful storm. That's it for now. We'll see you at the farm! We'll see you at market! If a giant bubble flies over your house, blame it on one of my boys! Posted 6/18/2012 4:25pm by OONA COY & BEN JAMES. We were weeding beets, leap-frogging along the rows to at least make it feel like we were moving quickly across the field. Leap-frogging means you're never next to the same person for long, but instead stepping in and out of one conversation or another as the talk splits in multiple directions, turns around on itself, ends abruptly and is taken up again by someone else. Sometimes I found myself listening to a conversation that I'd just been part of while starting a new one I was less interested in (and vice versa). It was like sitting at the Thanksgiving table with a very large family of talkers, except that every three or four minutes a couple of the people changed seats! And then there are those long moments when everyone is just busy with their hands and their thoughts, nothing else to say, the residues of conversations playing themselves out in our tired and sweaty privacies – a clear bed of beets behind us. So we never in our wildest imaginations thought the people of Northampton needed carrots & beets so badly, but we are more than happy to provide them for you. We'll have a ton of them at market this week in all their fresh, sweet, early-season glory. Also, strawberries are done, but we're pleased to say that the raspberries have ripened just in time to take their place! On the farm, we're very excited about the early poppies (as well as the other PYO flowers) just coming in. Click here to see what'll be available in the CSA shed this week. Please park in the designated parking area (which I've recently extended by several spaces) or further back along the right side of the driveway. Please do not park on the left side of the driveway, as it makes turning around and everything else more complicated. Make sure to email us ahead of time if you plan to use one of your two opportunities to pick up your share at market on Tuesday instead of at the farm. OK, that's all. Hope to see you all somewhere this week. Enjoy the food. Enjoy the HEAT! Posted 6/18/2012 3:51pm by OONA COY & BEN JAMES. In February, Mia tilled up the winter greens in the smaller of our two high tunnels. Oona seeded the carrots, and then we waited, and waited, and waited, wondering whether any would germinate at all. It took three weeks for the first slender green leaves to pop out of the ground, and many more weeks before it proved itself to be any kind of a crop worth keeping. We weeded them a couple times by hand. Then, in April, we pulled the greenhouse off the carrot patch and onto our adjacent, early strawberry patch, which we'd planted in September. Here's a picture of that (weeds and all). The strawberries were protected from the rains (which as we've seen can ruin a patch of berries very quickly), while the carrots did their thing out in the open air. Below is a picture of the carrots as they looked today (yes, weeds and all), right before the whole crew – plus Silas & Wiley – went out to harvest them. We don't often have the pleasure of Silas working with us, but he lost a tooth today, and while we were digging and sorting and bunching and packing, we all came to the agreement that Sials' aversion to farm labor must have fallen out along with that tooth. Click on the carrot picture to watch us all harvesting them in warp speed (or click here). And hey, we really do move that quickly. How else could we get it all done? We were so happy to have all the shareholders back at the farm last week! We were psyched to surprise you with PYO strawberries, and we were looking forward to offering them again. They'll be there this Friday, but no guarantees on quality, given the rains expected on Wednesday & Thursday. What we will have, however, is tons and tons of PYO sugarsnaps, an annual favorite! Click here to see what else we'll have in the share this week. And for all you market-goers, here's what we'll have this Tuesday at Tuesday Market. So come on over to market! We can't wait to see you there. Posted 6/4/2012 7:58pm by OONA COY & BEN JAMES. Welcome to sungolds. So long to strawberries. It's been a good year, and we'll have a mess of them at market this week, but these cold rains are sending the berries off early this season, which I suppose is OK. If I were a berry, I wouldn't want to sit in a mudpuddle either. This whole business is just so fleeting. The peonies are gone. The asparagus is gone. But then there are all these other fruits & flowers stepping forward. Strawberries on their way out, but there's consolation, exhilaration in all the ripening that surrounds us. Do you know that Denise Levertov poem? Here's the whole poem – Stepping Westward – a favorite. Silas and I placed the first poppy of the season on the memorial bike for Harry Delmolino, the young man killed riding his bike on Main Street last week. And here's another poppy today, doing its best to hold itself together in the rain. This week marks our first CSA pick-up of the season. Every year we look forward to the return of friends we've seen only in passing all winter. So welcome back shareholders! (and welcome, of course, to new shareholders as well!) Pick-up is Friday from 2:00 - 7:00 PM. Please walk or bike when you can, and please don't feel guilty when you can't. Click here to see what we'll have in the share room this week. We'll send you an email with more logistical details on Thursday. OK, don't forget about the Strawberry Dessert Party at market. It's not too late to make a dessert. It's definitely not to late to eat a dessert. In addition to the fun and the deliciousness, it's for a truly awesome purpose: funding the market's FoodStampsX2 program. See you at market! See you at the farm! See you somewhere! Posted 5/28/2012 9:29pm by OONA COY & BEN JAMES. This will not be an elaborate newsletter, because the only thing I really need to tell you about is the strawberries. All of the strawberries. The stacks & stacks of beautifuljuicysweet quarts we'll have at market this Tuesday. And here's shareholder Lucy last year showing us exactly what to do with one of those perfect strawberries. Check out these recipes for Spinach, Strawberry, and Maple-Nut Salad and Simple Strawberry Jam, which are also available on cardstock at the market. Some years we have flats of strawberries available wholesale for all of you jam-makers and berry-freezers, and some years we don't. This is an exceptional strawberry season, and we are happy to say we'll have flats available at market (8 quarts for $45). Please email, call, or text us if you would like us to hold one or more flats for you. 413 262 5489. We'll probably have flats available next week as well, but no guarantees. We could probably also arrange to have you pick up a flat or two on Friday, at least for a few of you. Hey 2012 shareholders, our first pick-up is Friday, June 8th. We can't wait! Lots more details will be in next week's newsletter. Come to market this week, remind us that you're a shareholder, and we'll give you a beautiful head of lettuce, a wee-tiny portion of the bounty that is to come (plus your 10% discount on anything else, of course). Our SALAD MIX is done for the spring and summer. We'll have it again in the fall. Lots of great salad greens (arugula, lettuce, spinach) are still available, but if you're jonesing for a ready-made salad mix, it doesn't get better than what they grow over at Old Friends Farm. Here's the ad-hoc recipe for the Raw Bok Choi Salad With Asian Dressing that Oona made tonight: Chop one head of bok choi into thin strips. Add a couple teaspoons of brown rice vinegar, a couple teaspoons of tamari, a half-teaspoon of toasted sesame oil, a couple teaspons of a neutral oil, and sprinkle some toasted sesame seeds on top. Add chopped cilantro or scallions if you like. Simple, tender, flavorful. Utterly delicious. Friends, please consider making a dessert for next week's Strawberry Dessert Party at Tuesday Market. Bring the dessert and a card with your recipe on it by 3:30 pm (or drop off earlier). The market will provide paper plates, forks, napkins, and whipped cream. Dessert will be served for donations of $4-6 that will go directly to the FoodStampsX2 program at Tuesday Market. More details can be found in the Tuesday Market newsletter. Let us know if you have any questions or want to tall us what you plan to bring. Posted 5/22/2012 6:43am by OONA COY & BEN JAMES. I built an alien vortex inhibitor. Actually it's a one-dimensional bamboo kohlrabi. It's a rustic tribute to John Travolta in Saturday Night Fever. It's an air-billboard in a lost language, translating roughly as, "You were right all along, Denise." Actually I'm not exactly sure what it is, and anyway it doesn't work, so I'll be dismantling it soon at replacing it with a trellis for flowering vines. I took a picture so you could see it before it's gone. And, yes, we will have SHAVED ICE this week, no matter the weather. 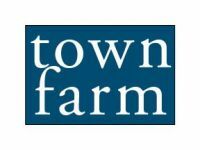 Also, finally, after numerous requests, we have TOWN FARM T-SHIRTS for sale in many sizes. Incredibly comfortable organic cotton shirts. Put a town on your front and a farm on your back, or buy one for your sweetie as well, and you'll have super TF powers, as shown in this pic. Come by our stand and pick up a recipe card for Honey Miso Noodle Salad, Unmi Abkin's famous dish from the golden days of Cha Cha Cha. That's all, except for some pictures. We hope to see you at market! Posted 5/14/2012 8:38pm by OONA COY & BEN JAMES. One of the major perks of being a farm kid is that – even though your parents discuss the difference between seedcorn maggots and cabbage worm maggots at the breakfast table, and even though one hen or another is always trying to peck your ham sandwich, and even though you can't walk six inches in any direction without someone shouting, Don't step on the lettuce, or Watch out for the asparagus – despite all these major inconveniences, there is this one serious perk – you always get to eat the very first strawberries of the year. I came in from the field today, the boys freshly home from school, and held out my open hand. Wiley saw them first. Strawberries, he shouted, such surprise and delight in his voice it was almost as if he'd invented the berries himself, or as if he were giving them their name for the first time. Silas was pleased too, but his sense of satisfaction is different from Wiley's. The fruits of the farm are no longer a constant surprise to him. He doesn't participate too often in the work of growing the food, but he's more and more aware of all the effort that's involved – not just the human effort, but the complex processes of soil & sunlight & growth, the time and the mysterious work of ripening. This past weekend the boys crossed the road with me to go and check on the cucumbers in the high tunnel. Along the way, we observed the two-inch-tall peas on their newly installed trellis. We saw the half-ripe strawberries (I had to work hard to talk the boys out of picking them). We munched a few young carrots, pinky-thick, with a sweet, delicate crunch. As we walked alongside the newly harrowed section of the field, Silas waved his arm in an arc and said, "Imagine what this is all going to look like." So I stood there a sec and I tried to imagine it: the rows of cherry tomatoes as tall as my head, the bright green frilliness of the carrot beds, the late-season kale, dark against the frosted ground. It's sort of what Oona and I do all the time. We plan where we're going to put the cops and we figure out how we're going to take care of them. But this was different. Silas wasn't asking me to plan, to figure, to problem-solve, to prioritize. I took him at his word. He was inviting me to imagine it, and I did so, and for a quick moment (about as long as it takes to eat a strawberry), I was actually satisfied. "This is Paradise," Silas said, and although it's not a word that's ever had much currency for me, I felt pleased that we had taken good enough care of this 3-acre field beside the highway (a field that for decades had either been neglected or overused) for it to be my kid's idea of the real thing. And maybe Head Lettuce, but the only one who knows that is Oona, and she's already pushed the two-year-old aside and climbed into bed beside him. Hey, our Salad Mix is quite a project. Every week it's a big improvisation of harvesting all the separate greens, washing and spinning them, assessing their quality and their quantities, and mixing them together in (hopefully) pleasing proportions. So to all you loyal customers who've been eating our mix all winter and spring, let us know what you think. How do you prefer it? A wee-bit spicy? More mizuna or less? Only when the greens are tiny and utterly tender, or even once they've built some character? It's different every time, but we still like to hear what you like! Hey, shareholders, in case you've been wondering: Pick-up starts the first week in June. We won't fail to remind you as the time gets close. For now, come by and say hi at market. Thanks!